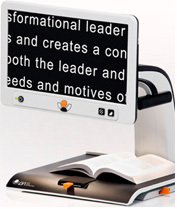 This Week's Featured Advertisement: Introducing MagniLink Vision, Low Vision International's Modular Video Magnifier That Truly Does It All! With the MagniLink Vision, this years' winner of the prestigious Red Dot award, you can choose your high resolution or high definition camera as well as optimal lighting conditions for both reading and writing. Select from a variety of screen sizes for reading hardcopy print, information displayed on a computer, or both, simultaneously! LVI's attention to ergonomic detail make adjusting the height of the screen effortless, whether manipulating print text, reading, viewing images, or writing. You can choose a control panel with two knobs, three push buttons, or five push buttons, giving you total control over the features you wish to have included with your video magnifier. And finally, some great news for my readers, LVI has added OCR to the Vision for a complete solution. Check out http://www.youtube.com/magnilink for more details. Whether for work, school, or home, LVI offers the perfect video magnifier for you. And the best part about it? YOU get to make the decisions that best suit your visual impairment, budget, and current life circumstances. For more information, please email Larry Lake, North American Sales Manager, at: llake@lviamerica.com or call +1 (800) 823-4158 today! 1) Kathy Ann Murtha is giving away full-length textbooks for Windows7, using either JAWS or window-Eyes. 2) And at the same time that Freedom Scientific has released JFW13, she now releases her $75 textbook on JFW 12. 3) Indeed, JAWS for Windows version 13 is available, featuring Convenient OCR for reading DVD menus and graphical pdf documents, enhancements to the Research-It feature, and a new Quick Settings dialog. 4) Michael Feir, long-time leader in making games accessible, will talk all things games on Tek Talk on GMT 1 November at 00:00. You'll probably find out about some accessible games with which you weren't previously familiar. 5) Freedom Scientific has converted some introductory training webinars that used to cost money into free webinars, and has lowered the prices on others. For example, a package of three 1.5 hour webinars on Word now costs $29. Also, basic training for JAWS 13 is available. 6) On Saturday, 29 October at 18:00 GMT, a special edition of the MacCessibility Round Table podcast will take place, where the Knights field questions about anything related to Apple and VoiceOver. You can listen live or download the podcast. 8) News from HumanWare: HumanWare Companion has been updated to version 3.5, fixing bugs and improving interaction with the Bookshare site. And version 9.2 of the Apex products is out, allowing for the reading of PDF files, better use of QWERTY keyboards and ability to download larger files among other fixes. For questions and comments regarding Tidbits, please e-mail Dean Martineau at dean@topdotenterprises.com. Dean Martineau provides adaptive technology training in English or Spanish by phone, online, and in person, with flexible arrangements, and at affordable prices. Visit the 2011 Tidbits Archive at http://www.flying-blind.com/tidbits2011.html where you can grab back issues. All that welcome information for future issues can be directed to Dean Martineau at dean@topdotenterprises.com.